Like many families, we love Disneyland. It’s a pretty pricey trip for a large family, so we don’t go as often as we’d like, but when we do go we always have a fantastic time! Since there’s not much you can do to get around the ticket prices, one place we really try to save money is on food. We are a family of 7, including 3 teenage boys, which means the food alone for a trip to Disney can take a big chunk of our budget. But being a cheapskate, I’ve done my best to figure out how to keep those costs down while still having a great time. 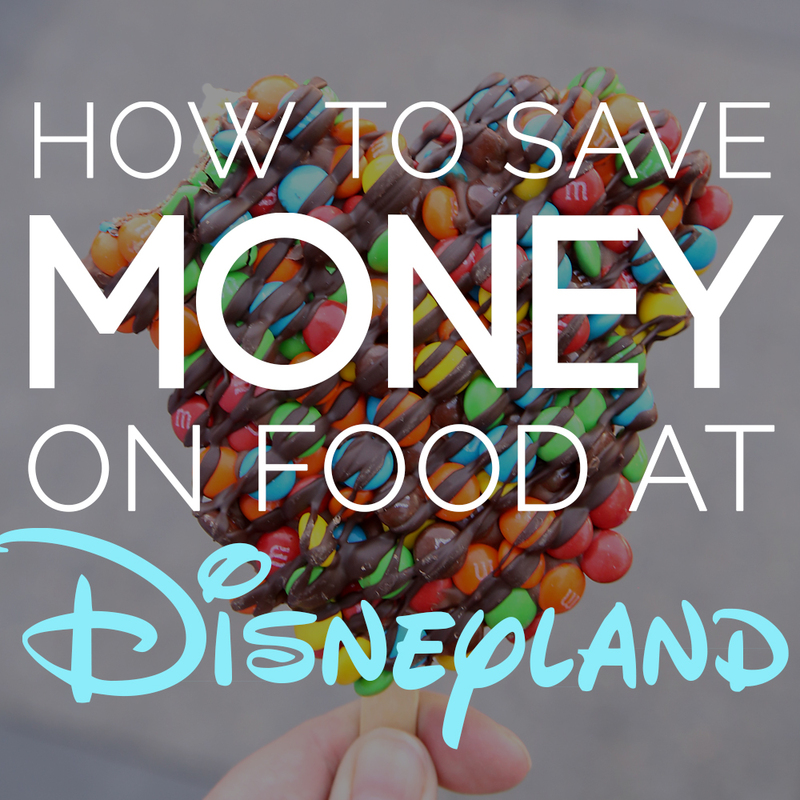 Read on for the 12 best hacks for saving money on food at Disneyland without sacrificing a good time. And don’t forget to check out 37 genius hacks for your best Disney vacation ever. 1. Stay somewhere with a great free breakfast. Food inside Disneyland Park and California Adventures is expensive, so the very best way to save money is to minimize the amount of food you need to buy there. A great way to do this is to stay at a hotel that offers a hearty free breakfast. Depending on your family, it may even be worth spending a little more on your hotel to find one with a nice breakfast offering. 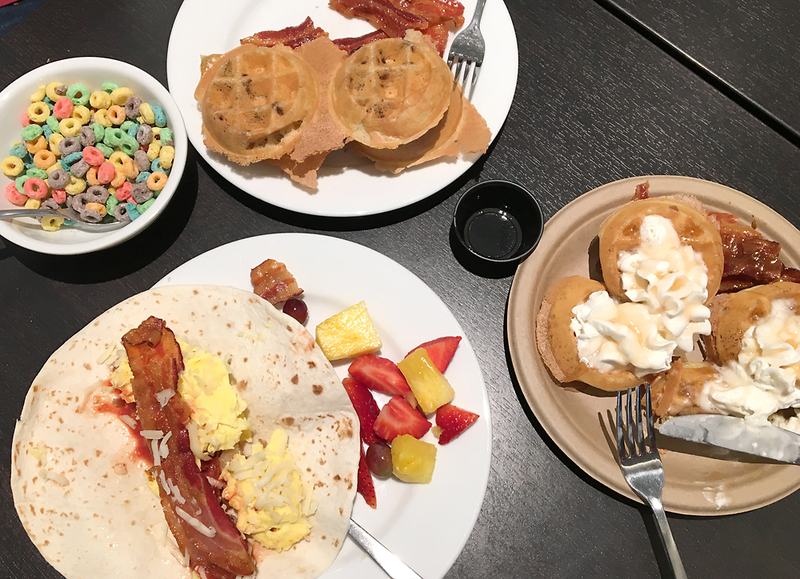 We have three teenage boys and they ate 3-4 plates of food every morning at our hotel on our last trip: eggs, bacon, waffles, yogurt, fruit, toast, juice, etc., all for free! It was wonderful! NOTE: Read reviews on the hotel you’re considering to find out what the free breakfast entails. 2. 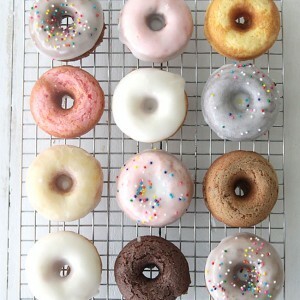 Stock your hotel room w/breakfast items if your hotel doesn’t offer a free breakfast. Buy things like bagels and cream cheese or peanut butter, fruit, cheese sticks, etc. If you’re planning to get to the park before the gates open (and you should!) you can bring some of this food with you to eat while you wait in line. Cereal also makes a great late night snack! 3. Take snacks with you. Disneyland won’t allow in coolers full of food, but they will allow just about anything else. We always take backpacks FULL of snacks with us for a day in the park. No matter how big of a breakfast your kids ate, I can guarantee you they’ll start telling you they’re hungry an hour after you walk into the park. And it’s much nicer to hand them a granola bar you bought for pennies at the grocery store instead of spending $3 on a bag of chips every time one of your kids get munchy. 4. Have your kids carry their own snacks in fanny packs. Seriously people, this idea may seem silly, but it’s actually GOLD. Get each child a cheap fanny pack before your trip (the thrift store is a great place to find them) and then let them pack it full of snacks each morning. They can keep the fanny packs on all day long and snack whenever they’re hungry. The first time you stand in a long line with your kids happily sipping from applesauce pouches instead of complaining to you that they’re hungry and bored you’ll realize what a lifesaver this can be. We’ve done it every time we’ve been to Disney and it’s always worked really well. Here’s a huge list of easy to pack snack ideas, including lots of healthy options. 5. Use a grocery delivery service to have snacks + other food delivered to your hotel. 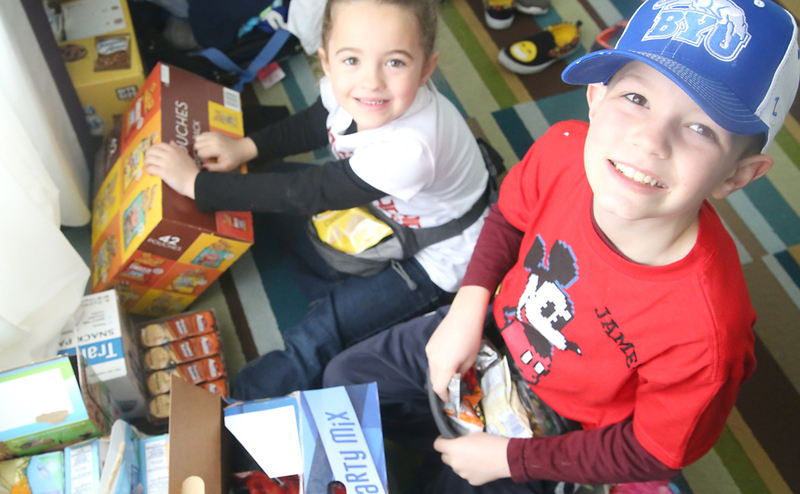 We drive to Disneyland, which means it’s easy to load up the car with plenty of snacks and bring them with us, but if you’re flying, you can still make this work. Schedule a grocery delivery from Vons in Anaheim before you leave to have all the snacks, breakfast items, or anything else you need delivered to your hotel after arrival! 7. Have a plan for what food you’ll buy in the park. You don’t need to avoid buying food in the parks altogether – you’re on vacation after all – but it helps to have a plan to keep from blowing your budget. If you have a nice breakfast before arriving at the park and then bring plenty of snacks to eat during the day, you may be able to get by with only purchasing one meal (a late lunch) in the park, and then do an easy and inexpensive dinner after you leave the park in the evening. Or maybe something else works better for you. But if it’s important to you to save money, make sure everyone in your family is aware of the plan before you arrive – it’s hard (and not very fun) to tell your kids “no” on vacation, so it’s better if they know what to expect before you get there. 8. Let kids know how many treats they’ll get to buy per day. 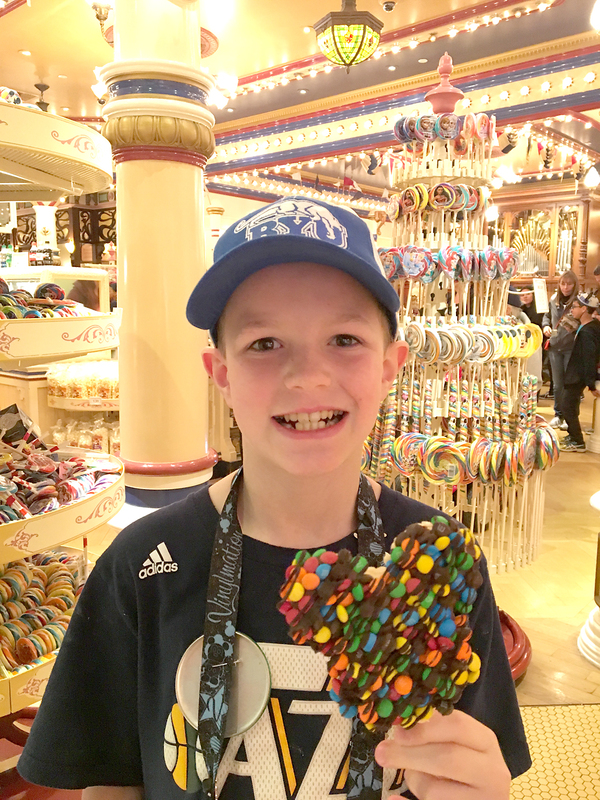 There are so many fun treats all over Disneyland – from Dole whips and Mickey shaped rice krispie treats to popcorn and cotton candy. Kids will see all the options and they will want EVERYTHING, which is going to make your life hard if you’re trying not to spend too much money on food. We’ve found the best way to deal with this is to explain to the kids that they will each get to choose one treat to buy at the park each day. Then when they ask for their treat at 10 am, I remind them they only get one for the day and they can have it whenever they want, but maybe they want to wait a bit and see if there’s something else they’d rather have? (This works best if you’ve brought plenty of food to snack on in the mean time.) 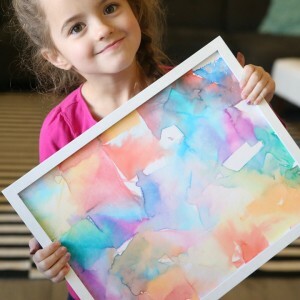 I’ve been really surprised at how well even my young kids have done at accepting there will be one treat – they usually spend most of the day planning what they will get and checking out options, and then finally choose something near the end of the day. 9. Look for easy, less expensive meal options outside the park in the evenings. If you had a late lunch, there’s a good chance you can wait until after you leave the park to get dinner (unless you’re staying until midnight, of course). We were always so worn out at the end of a full day at the parks that we usually just drove through somewhere, ordered pizza, or ate cereal back at the hotel. There’s a McDonalds quite close to the park entrance on Harbor Blvd, and lots of pizza places that deliver to the hotels. 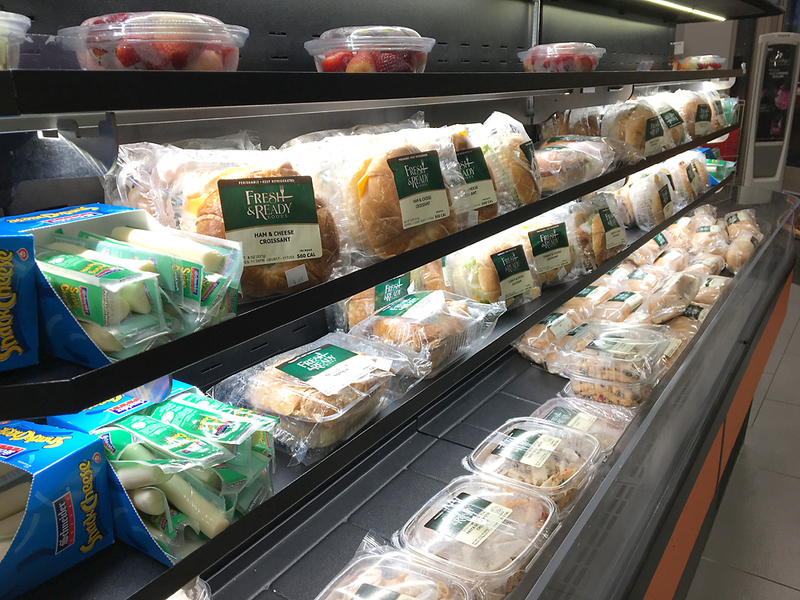 If your hotel is south of Disney and you’ll be walking down Harbor Blvd to Katella, there’s a large CVS that has a good selection of sandwiches, salads, fruits, snacks, ice cream, etc., for an easy dinner. 10. Check out the Disneyland restaurant menus before you go. Adult meals in the parks run between $10-$15 in the counter service restaurants, and $25-$50 in many of the sit down restaurants. Additionally, most restaurants only offer 3-4 different choices, which means it’s very helpful to have an idea of which restaurants will work best for your family before you get there. Browse menus before your trip, and jot down the names of restaurants in a few different areas of each park that would work for your family. There’s nothing worse than spending too much money on food that your kids don’t even want to eat. 11. Split meals in the park. The nice thing about Disney meals is that most of them are fairly large, and can easily be split by two kids or even an adult and a child. Most kids’ meals are all around $8, although at some restaurants you can find a toddler mac’n’cheese meal for $4.50. Instead of spending $15 for each of the 5 adults in our family and $8 for each kid ($90 + tax), we often bought 4 meals and split them up between all of us (around $60). 13. Take the monorail to Earl of Sandwich. One of our absolute favorite places to eat in Disneyland is actually in Downtown Disney. 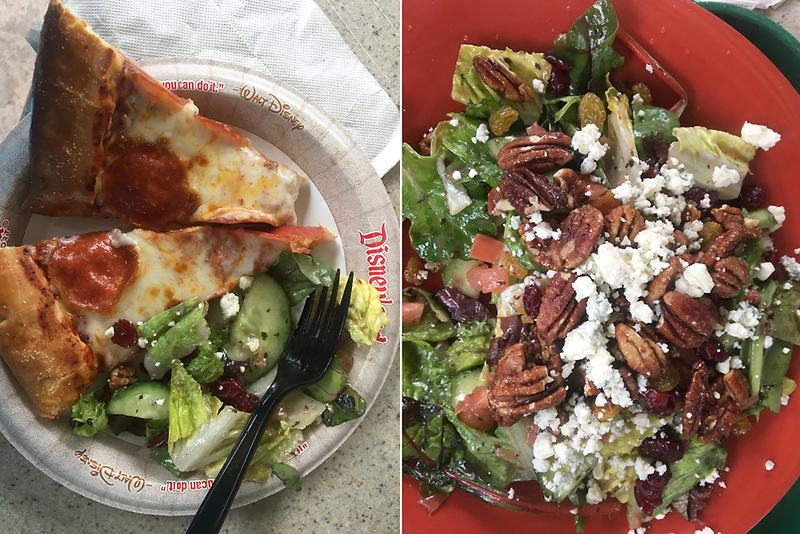 If you take the monorail out of tomorrowland, it drops you off right in front of Earl of Sandwich, a great counter service restaurant with fabulous sandwiches, great salads, soups, pizza bread, and tons of yummy baked goods. The menu is large enough that everyone will be able to find something they want, the food is tastier than what you’ll find in Disney, and you can get cookies for everyone for just a few dollars. Plus the large outdoor seating area is a nice place to sit and relax away from the crowds in Disney. When you’re done with lunch, just hop back on the monorail and ride back in! 14. Order the bread on the side at Pacific Wharf Cafe. Pacific Wharf Cafe in California Adventures sells salads or soup in a large, fresh breadbowl. 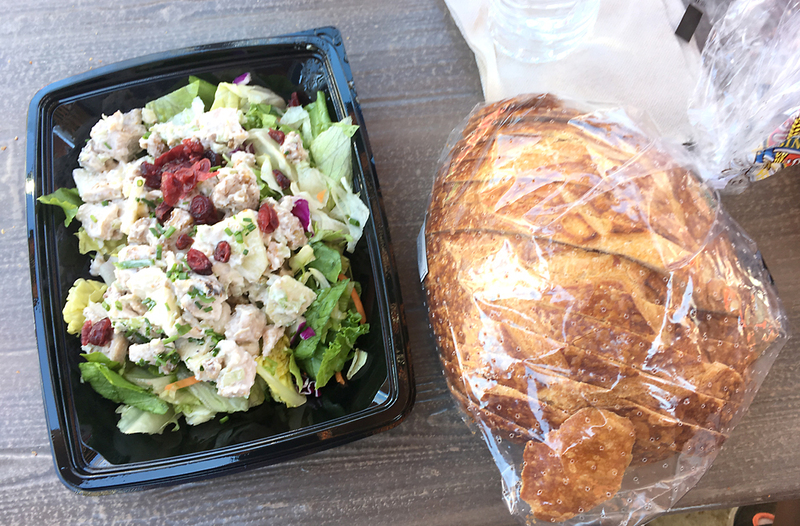 It’s a good option because the meals are on the cheaper end of Disney dining ($11 each), but most people who order them eat the soup or salad and end up throwing away most of the bread. If you’re traveling with kids, order your soup or salad with the bread on the side. I think you end up with a larger portion of salad or soup, and then you get the entire loaf of bread sliced in a bag. If you ordered the chicken salad you can make a couple chicken salad sandwiches with the sliced bread, or picky kids can just eat bread and butter. If you’re really smart, you might grab individual packages of peanut butter and jelly from your hotel’s breakfast buffet and tuck them in your backpack so you can make PB&J sandwiches! 15. Visit Whitewater Snacks in the Grand Californian Hotel. In California Adventures, there’s an entrance/exit straight into the Grand Californian Hotel (near the Grizzly River Run ride). If you exit the park, walk down a hallway, and turn left just before you get to the pool, you’ll find Whitewater Snacks, which is the hotel’s pool snack bar. It’s a really nice place to get a quiet meal away from the crowds at the parks. There is a counter service restaurant with food that’s a little cheaper and a little tastier than most food in the park (I hear the carnitas nachos are amazing!). There is also a small grocery area where you can get milk and cereal and other snacks that picky kids might like better than the meals offered in the park. And, for soda lovers, this is just about the only place you can get free refills on soda in either park! Do you have any money saving tips for a Disneyland trip? Leave them in the comments! And don’t forget to check out 37 genius hacks for your best Disney vacation ever. Thank you for the information! Very very usefull for every similar occasion. thanks a lot!! My other tip would be birthday clubs! Almost every restaurant in downtown Disney has them, and some of them are amazing! 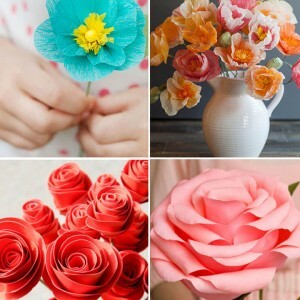 Patina group will send you a $30 off $60 certificate good for the month of and up to 60 days after your birthday, so don’t think you have to go day of. Earl of sandwich offers a free sandwich, rainforest cafe has a gift certificate, wetzel’s pretzels, Jamba Juice, etc.! You have to walk (or take the monorail) out of the park, but if you’re on a budget it’s totally worth it. Where do we go to sign up for that? I am sure your tips was really worked to save my money in disneyland, friend your blog is always provide a great information. Great tip on ordering the bread on the side! Will definitely try that! What great ideas! 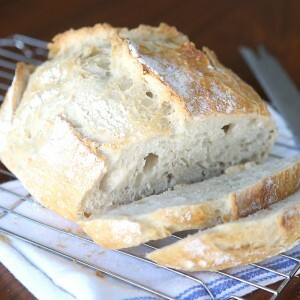 I loved the bread idea. We would buy baguettes in Epcot as a meal but didn’t know a place at Disneyland. To help curb the snack gimmies all day long we would give our kids a $5/day budget. This helped them be very choosy and learn a little about budgeting.